As I daydream of the foods to gorge on in Mumbai, M interjects my reverie – she needs a small diamond cluster earring. But you already have a beautiful pair, I remind, as if any woman can actually forget the glittering rocks they have. Those are too big; for work everyday I prefer something smaller. I wish she was a food gourmet, it’s less expensive. And so, we’ll put together our list of things to get in India. Jewelry, salwar khameez and other dresses for her. Eating out, books and music for me. 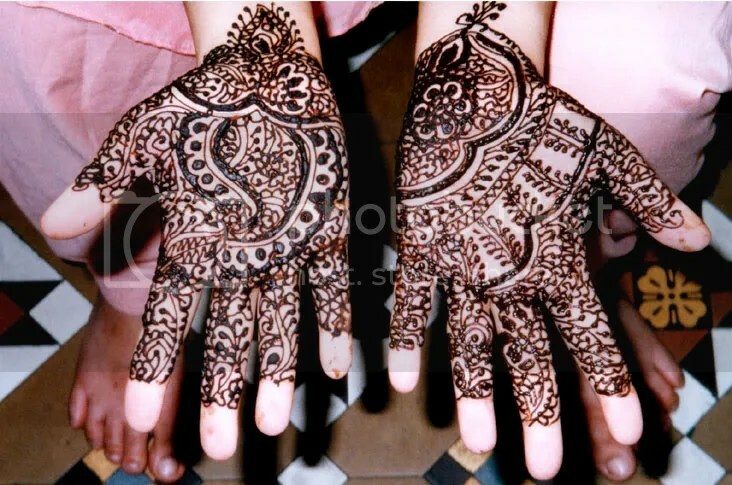 One thing is certain, a day before we return, one of my cousin sisters will organize a mehndi session. They usually ask a talented lady to come home, and after dinner all my cousin sisters, sister-in-laws, nieces and whoever, get their hands decorated. Whenever I poke my head in, its a treat to see all the girls treat themselves in such a collective manner, joking with each other, giggling and sharing in the camaraderie. As one gets her left hand decorated, with her right hand she designs anothers. And so a whole chain of young women, little girls at heart, helping each other amidst a squealing cacophony. With both their hands covered with mehndi, they also relax knowing they wouldn’t be called to bring water, or make chai, or other silly things for the menfolk. I only wish such joys visit them always, and for the rest of their lives. For they who make our lives worth living, what are a few diamonds! beautiful~ I was able to find a local artist to paint my sisters belly about a week before she gave birth. It was quite an experience!! Glad it worked out for you (and your sister). Where have you been? We have Satsang at Pepperell to bring in the New year. Thank you. Obviously, this was pre-Meera days. Thank you Aish. Do I know you?